+$Though you may be a creative by trade, you may not have considered the advantages a camera can bring you. Adding photography to your portfolio of skills can open up many doors – and apart from anything else, photography is a lot of fun in its own right. +$The next question is: what's the best camera to buy? Creatives and photographers have all sorts of different needs when it comes to their kit. That's why we're here to help, with our round-up of all the best cameras that creatives can buy right now. No matter what your budget, ability level, or background, there's a camera here for you. Our dedicated tool automatically checks prices from all reputable retailers, so you can be sure you're getting the best deal, too. +$Of course, the best camera for you depends on what you need it for. Whatever your creative output, we’ve got the right option in our guide: you’ll find the best DSLR and our favourite cheap DSLR at the top of this list, with superb mirrorless and compact options further down. We’ve also covered the best action cameras, as well as the best travel camera for your holidays – and even the最好的拍照手机+$, for those times when you don't want to lug a full camera about. +$A triumphant achievement by Fujifilm, the+$X-T30+$is a mirrorless camera that packs an incredible amount of tech into a small camera body. It's the smaller sibling to the flagship X-T3, with a lower price tag to match, and this winning combination of power and price makes the X-T30, in our eyes, the best camera around for creatives right now. It sports the latest 26.1MP X-Trans CMOS 4 APS-C sensor and X Processor Pro 4, but where advancements have really been in made is in the super-sophisticated autofocus system, with 2.16 million phase detection pixels that cover 100 per cent of the frame, able to work even in extreme low-light conditions. +$The X-T30 uses an electronic shutter that allows the user to burst-shoot at up to 30fps with no viewfinder blackout, and it can capture 4K UHD video at a maximum frame rate of 30p. The camera's ergonomics are first-rate, making use of Fujifilm's signature dial-led controls for a tactile handling experience. It's an utterly superb camera by any standards, and the fact that it comes at a sub-£1000 price makes all this all the sweeter. If you’re feeling a little more flush, take a look at the Fujifilm X-T3, which is this camera's more powerful big brother. +$Number 5 in our list is the尼康Z6+$. In 2018 we saw an explosion of full-frame mirrorless cameras as Canon, Nikon and Panasonic started muscling in on this territory. For our money, this is the best choices for creatives in this department – it blends comprehensive functionality and top-notch image quality with fast autofocus and fantastic low-light performance, all wrapped up in a body that doesn't cost the earth. The larger, more sophisticated Z7 is pitched towards professional photographers, and we reckon this slimmed-down model is the better choice for creatives. You still get access to the exciting new range of Z mount lenses, and the 24.5MP of resolution is going to be more than enough for most purposes. +$The wide ISO range (expandable to 204,800) makes the Z6 an extremely capable choice for low-light work, and the in-body image stabilisation and 4K video using the full width of the sensor both add to this tremendous package. 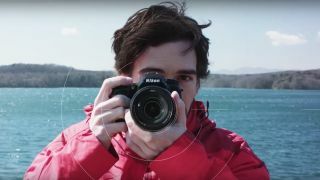 If you're feeling especially flush you might want to consider the NIkon Z7, which boasts a considerable 45MP of resolution, but we think the balance the Z6 offers between price and power will be a winner with any creative.